Communication is critical to our success in every area of life. We often think of communicating simply as transferring information. But, it is so much more. Communication is also a transfer of feelings and emotion–a meeting of two souls. This is why two people can say the same sentence to you and have it mean two entirely different things. More than the words, what really transfers meaning is the nature of the relationship and the level of trust in that relationship. For example, someone says to you, “will you be going home early today?” Does it make a difference in the meaning whether these words are said by your spouse, your boss, a customer, a co-worker, or a stranger? Of course, it does. Each relationship gives the sentence different meaning. In addition, the meaning can change depending on the level of trust in the relationship. In the example above, if your spouse asked, “will you be going home early today,” it could mean he or she is excited to see you. Or, on the other hand, in a relationship lacking trust, perhaps it means that the spouse is keeping tabs on your location out of suspicion. If your relationship with your boss is good, the sentence above could mean “you’ve been working so hard lately, you deserve a break!” Or, in a poor relationship, it might mean “are you slacking off, again?” If the sentence came from a perfect stranger, would you tell them without hesitation? Or, would you be suspicious of why this stranger would want this personal information? From all of this we are reminded that communication is not the words alone, nor is it solely contained in the voice inflection or tone of the message. At its core, communication is the words and tone measured against the roles and level of trust we have with that person. Sometimes communication occurs without any words at all. Have you ever been in a conversation with a group of people and had a close friend look at you and raise an eyebrow at something that was said? There is instant communication. Volumes of information are contained in that small gesture–without a single word being uttered! I once participated in a training program designed to help people communicate their message more effectively. 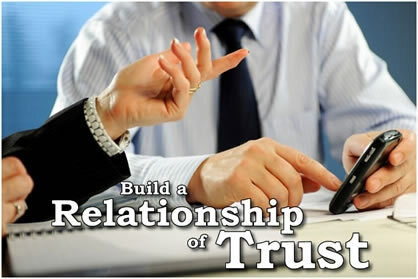 The central idea of this training revolved around the acronym, BROT, which stands for Build a Relationship of Trust. The message? Improve the relationship and you improve the communication. Dr. Stephen R. Covey gives similar advice using the metaphor of an “emotional bank account.” If we have made constant deposits into our emotional bank account with someone in the form of trustworthiness, kindness, consideration, and honoring commitments, then our communication with that person will be clear, rich and satisfying. On the other hand, if we make large withdrawals such as dictatorial demands, failure to listen, breaking our word, etc., the relationship suffers and communication is difficult. Success Tip: If you are having trouble communicating, work on the relationship. Traditional communication skills and techniques can only make superficial improvement. The key to long-term success in communicating is to build a relationship of trust. Trust is were it all begins. Thank you. Great write up on communication. I agree that communication is based on the interpretation of ones relationship. Trusting someone, as opposed to not, make all the difference in the world when distinguishing a statement. Thank You, this will be helpful. Great reminder! It’s not the words, it’s the person.